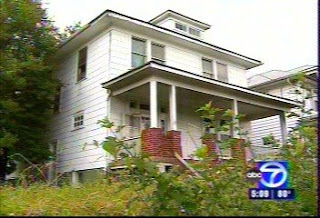 WJLA reports: This Woodridge home might appear abandoned, but it turns out there's a very long-time resident still living there. By my math, her family has had the house since 1949. With no water, no electricity, and no services, Eva Rusk, 72, still scrapes by. Although, for better or for worse, times are changing for her and it's a safe bet she'll be in more modern comforts before long. Reading the article and watching the video, I tried to make out the corner. 1847 Which St? My eyesight (and my video resolution) not being what it could be, can anyone tell what intersection this is? Just curious: When this house gets sold off and refurbished, at a significant increase in value, is it still gentrification? How much of gentrification is about protecting the poor and old (including an unexpectedly tenacious old white lady) and how much is about keeping the historic racial/ethnic character of a neighborhood? Of course, up until far too recently, this same neighborhood had covenants to keep African-Americans from buying. This family bought just as the rules were overturned and as Woodridge went from a predominately White neighborhood to largely African-American. Of course, I don't know anything about the Rusks or their history in Woodridge and I don't mean to imply anything. I'm just taking this one story and using it to ask other questions. All around, it's an interesting story. I love that house and always wanted to live in it. It's on Monroe and 20th. That poor lady. I hope she's ok. Honestly... she should sell that house and move into smaller digs with utilities. That house is probably worth $400k as is. Just to clarify: She DID sell the house, several years ago. And that owner went into foreclosure but she never moved out. So, actually, she's got nothing left. We've always wondered about that house which is on Monroe and 20th. Its good to know some of the back story. Honestly there are other houses in the neighbor that had similar aesthetic problems. Today we saw a pug roaming monroe st, turned out its owner is in one of those other aesthetically challenged houses. This house residents where also older residents. I wonder how big a problem this is in Brookland/Woodridge? I live around the corner; in two years, I've only seen the woman referenced in the story once. Her son (I suppose) and someone I presume is his girlfriend are nearly always around. He has the lawn cut every few months, only after it gets 4-5 feet high. The house is an absolute blight on an otherwise wonderful neighborhood, and a piece of property that, with its size and location, would be worth a pretty penny if fixed up; similar houses on the block have gone for more than $600K in the past year.